Type H190 injector is suitable for type 190 diesel engine made by Zhongshui Nantong Haishi Shipbuilding Machinery Company. Type H190 injector is multi-orifice closed type with opening pressure of 27MPa and needle lift of 0.45, which pressure is regulated by washer. Type 12V190 fuel injection pump is designed and developed by our plant with its patent right. It is suitable for type 190 diesel engine manufactured by Jinan Diesel Engine Plant of China Petroleum Ministry. 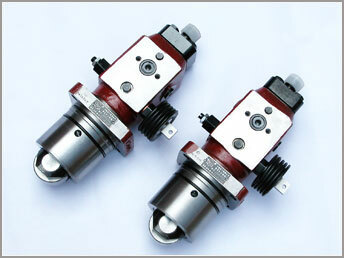 Type 12V190 fuel injection pump is equipped with constant pressure delivery valve and plug-in roller.